I am trying to calibrate my accelerometer and magnetometer. I am using FreeIMU's calibration tool and I can do everything, except I have no way to reliably and smoothly rotate my sensor through the range of motion required for calibration. Does anybody have any tips for how physically manipulate my sensors in a smooth motion 360 degrees about the X, Y and Z axis? I thinking about making a sort of gimbal jig, but before going through that effort I was wondering what other people have done. I use a different method which doesn't require "smooth rotation", so I don't know. Is your sensor incorporated into a device ? You could try building one of those spinning table centrepieces that chinese restaurants have. 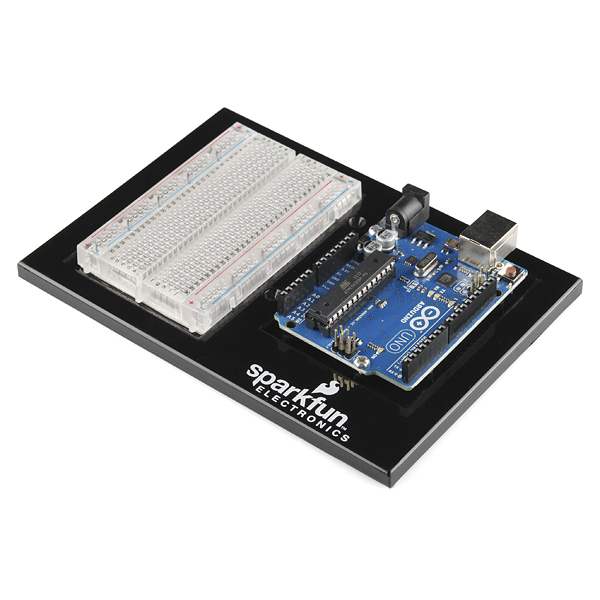 Currently, my sensors are on a breadboard and connected to my Uno R3 using Sparkfuns Ardunio/Breadboard holder. 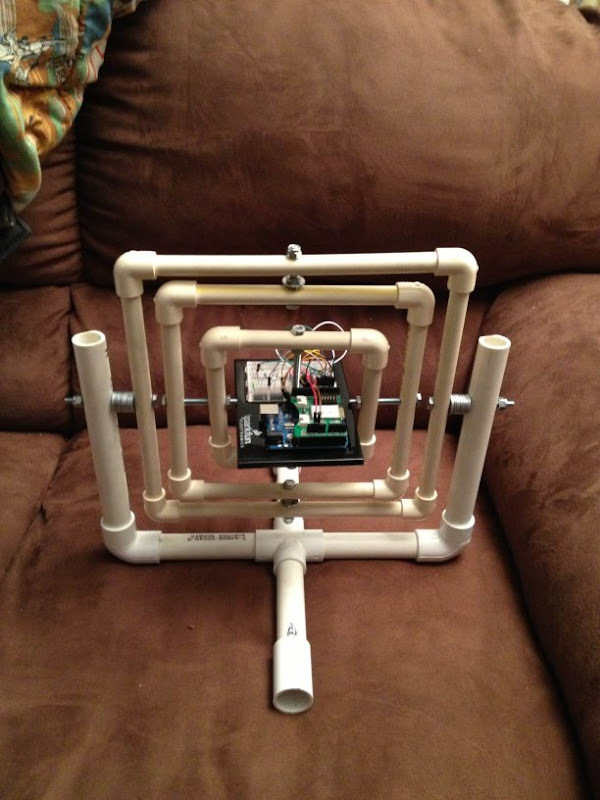 I think I am going to be build one, maybe using various sized PVC pipe or something like this. What method did you use michinyon, is it something that I might be interested in? I need something to calibrate the X, Y, and Z axis for both my magnetometer and accelerometer. Even if your method only calibrates one or the other, I would still be interested in it. which you can do with some kind of turntable. If you want to build some kind of 3-D gimbal thing, go ahead. I am wanting my sensors to give me a full 6 DOF, or I guess 9 DOF with the magnetometer, so I assume I need to properly calibrate all 3 axis of the acc and mag. I have tried calibrating by rotating 360 degrees around each axis, and then translating in a circle in all 3 planes. I am using Fabio Varesano's (may his soul rest in peace) calibration tool which is in Python and uses an ellipsoid into sphere algorithm. Maybe the algorithm used is more sensitive than your Matlab code with respect to needing smooth data in all planes and axes of rotation. I think I will probably create a gimbal like I mentioned above, it will be fun simple project anyway, and if I can't calibrate my sensors with that, than I will probably look into other algorithms or maybe writing my own to calibration program for my sensors. well the 6-dof and 9-dof are much abused teminology which I don't use. Because they are not, really. vector and in the second case, the earth's magnetic field vector. which gives the least sum squared deviation from the sphere. which can be approximated as an off-centre ellipsoid, to a sphere. difference for the gyro would be very hard to measure, you would need a calibrIn my experience, this is best done every time you use the device. Thanks for the description of your calibration method, interesting stuff indeed. I purchased components to make my 3 gimbal calibration device already. I am using 1/2 CPVC with 90deg elbows. Actually ended up being really cheap, about $14 for everything. I think I am going to write my own calibration program, even if I can get my sensors calibrated with the FreeIMU calibration tool, just so I can gain a better understanding of these sensors. And because, I find the FreeIMU calibration tool cumbersome to use. If you don't mind my asking what about your project would require you to use a gimbal rig to calibrate your accelerometer? 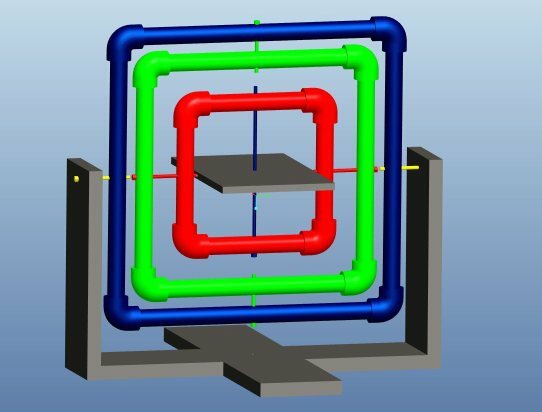 Nothing specifically about my project, I just have not been successful in calibrating my sensors when turning them by hand 360 degrees around X,Y,Z axis. Every time I attempt to calibrate I get very different values. My setup uses BlueTooth, so it should be fairly easy to set it in a gimbal rig and smoothly control the motion about each axis to collect better samples to use in the calibration algorithm. I need the sensors to to determine rotation, and translation in all axes, so I would like them to be calibrated as accurately as possible. Please post some pictures when you're done. I might need to make a rig like that, to test the project I'm working on. I sure will. Cost me less than $20 in 1/2" CPVC and the necessary hardware. I should have pics up tomorrow. It's about 12" tall by design. I designed the base, and was thinking of using plywood or 2x4"s, but ended up buying 3/4" CPVC with a 4-way for the middle part and 2x90 deg elbows for the arms. Alright, here is the finished sensor calibration jig. Ended up being about $25 for all the PVC and hardware. The gimbals are 1/2" CPVC, the base is 3/4" CPVC, and the rest is various nylon locking nuts, bolts, and spacers. The long piece through the middle of the sensor base is 1/4"-20 all-thread. I bought a 12" piece and used a hacksaw to shorten it to about 6". Now I just need to modify the FreeIMU calibration GUI tool and bit to accept inputs from my BlueTooth software serial port and I should be good to go. It stands just over 12" tall.